Captain Forsyth and Sergeant McLean, Spy Hunters, are agents of British Military Intelligence. At least that is the implied state at the start of the series but this quickly changes with Forsyth being shown to be just a very dependable, often called upon army leader and Sergeant McLean is just one of the NCO's that Forsyth might command. It is fascinating, in fact, that after just a couple of initial adventures, the good and trusty sergeant is never mentioned by name despite having equal billing on the masthead. Both Forsyth and McLean are members of the Seaforth Highlanders, a regiment that came into existence in 1881 and would last as a distinct unit until 1961 when it merged with another regiment to become the Queen's Own Highlanders and merged with yet another one in 1994 to become the Highlanders. Its name, according to Wikipedia, comes from its founder, Kenneth Mackenzie, 1st Earl of Seaforth. Forsyth is depicted as a man in his early 30s with dark hair cut in standard officer style (short but not acutely so) and wearing a neatly trimmed mustache. He is ramrod straight in posture and is very much a military man with his ability to bark out orders with decisiveness as well as take orders from his superiors without question or comment. He favors a pipe but otherwise has no obvious vices. McLean, in the very few times we see him, sports a kilt and a short sleeve blouse with his head topped normally with a Balmoral bonnet. Like his boss, he has a mustache (thinner) and enjoys a pipe now and then. On odd but interesting point to mention is that though there are 15 adventures in the recorded series, we never learn the first names of either of the stars (except for Forsyth's use of the normal nickname of "Mac" for McLean. 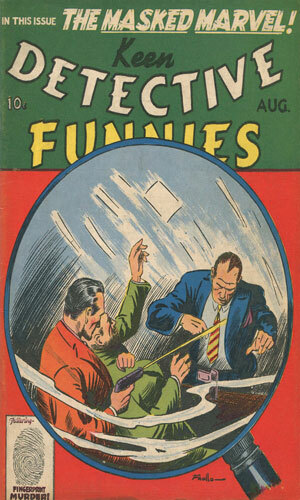 As indicated by the main name of this series, the purpose for the two men should be seeking out and removing enemy spies. Except for the odd mission here and there, looking for spies is never the primary objective though considering the sort of adventures Forsyth has he does come across more than his share of sneaky individuals. Spy hunting, though, is not really happening. What is going on is fairly normal, reasonably interesting military operations fighting to preserve Britain's control of its domain in three basic regions, India, Palestine, and China, before heading to France to take part in the new struggle against Nazi Germany. Rebels, insurgents, unhappy local populace, and others are the sort of people that Forsyth has to deal with as he goes about his duties following orders and keeping the peace. 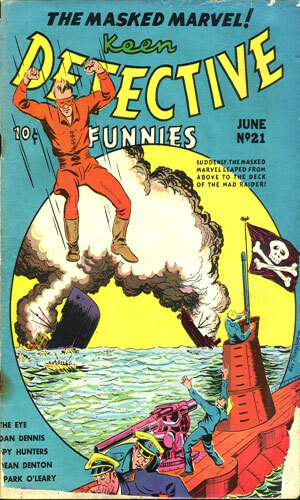 One of the earliest entrants into the comic book industry was Centaur Publications which, according to Wikipedia, had been publishing pulp magazines since 1933. 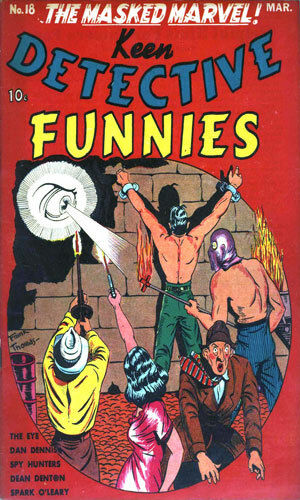 In 1938, it bought out Ultem Publications. 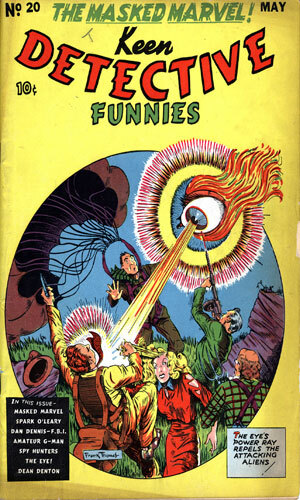 Centaur Comics was its new comic book wing from which several series came. 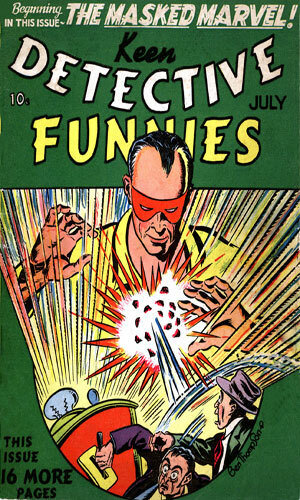 Keen Detective Funnies was one of lines developed promising "fast action in complete pictures!" Exactly what was meant by complete pictures is not known. 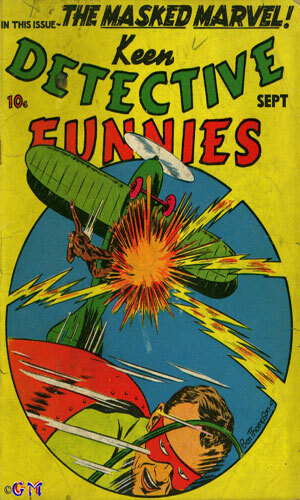 Its first issue was volume 1, #8 in July 1938. It introduced an assortment of characters, few of which lasted very long. Most famous of these, if not that famous, was "The Clock" Mystery Detective, a fellow who solved crimes while hiding behind a black handkerchief with eye holes in it. 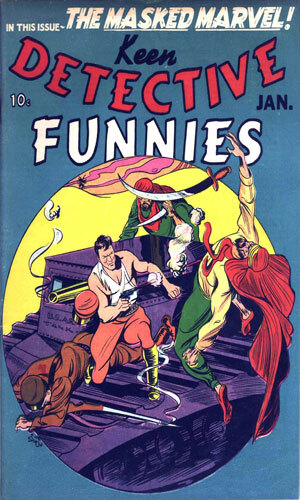 Keen Detective Funnies numbered their releases as volumes initially, with v1 having issues #8-#11 followed by v2 with #1-12 in 1939, and then v3 with issue #1 in 1940. 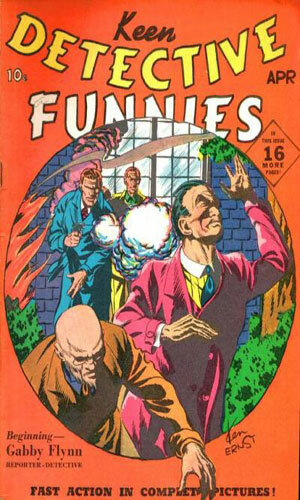 At that point they changed their numbering scheme to be like other comics and went to a straight numbering system. Since there had been 17 issues under the previous method, this new style started with #18 and lasted until the publication ceased with #24. 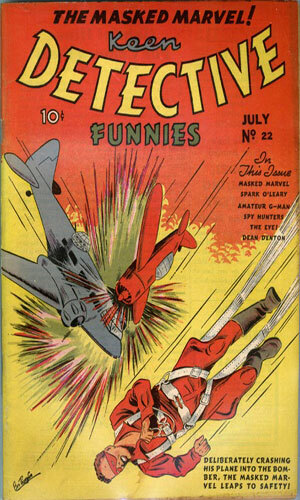 Captain Forsyth and Sergeant McLean, Spy Hunters, make their initial appearance in issue #7 (volume 2, #3) in March of 1939 and would last almost to the end of the magazine's life, stopping with #22 in July, 1940. From Keen Detective Funnies v2-3 (#7) - In India, Forsyth is told to ferret out who is passing troop movements to the rebel hillmen. He has McLean follow a suspect, uncovering a surprising operation underway. From Keen Detective Funnies v2-6 (#10) - In India, Captain Forsyth is certain someone has been pilfering intel from his locked desk so he and McLean set a trap. From Keen Detective Funnies v2-7 (#11) - In India, someone is poisoning those on a pickup field hockey game and Forsyth is determined to find the killer. From Keen Detective Funnies v2-8 (#12) - In Hong Kong on vacation, Captain Forsyth agrees to ride along on a trip up the coast, getting involved in some deadly explosions. From Keen Detective Funnies v2-9 (#13) - In Shanghai, Captain Forsyth wants to know who has been kidnapping his men and why. 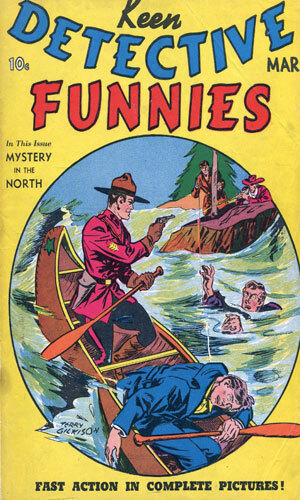 From Keen Detective Funnies v2-10 (#14) - In Palestine, Captain Forsyth and his men are ordered to a remote location to provide protection of an oil pipeline. From Keen Detective Funnies v2-11 (#15) - In Yansing, China, the local government authorities have quarantined the British compound and it is up to Captain Forsyth to find a way to get free. From Keen Detective Funnies v3-1 (#17) - In Palestine, two tourists are living it up and attracting attention. When they get kidnapped, it is up to Captain Forsyth to free them. 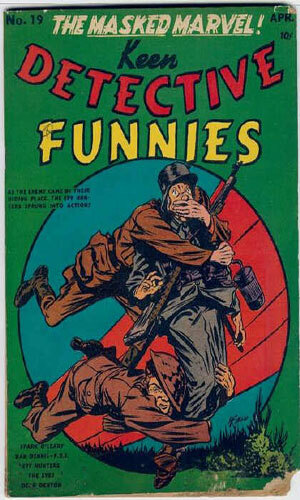 From Keen Detective Funnies #18 - In India, a scouting patrol finds a village strangely empty. Captain Forsyth is certain something is untoward. 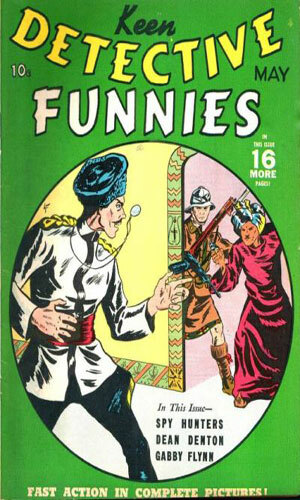 From Keen Detective Funnies #19 - In India, Captain Forsyth and his battalion is transferred to Brest, France, to take part in the War effort. 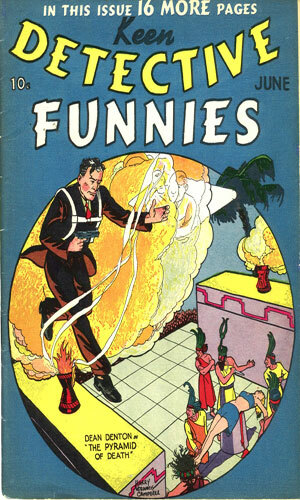 From Keen Detective Funnies #20 - In France along the Maginot Line, Captain Forsyth is suspicious of a young woman who has escaped a small town the Germans had recently conquered. From Keen Detective Funnies #21 - In France along the battle line, Captain Forsyth is told to learn more about the German's newest tank. 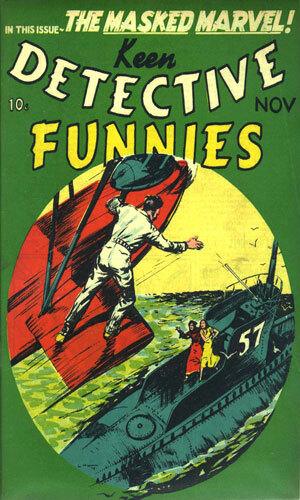 From Keen Detective Funnies #22 - In France, Captain Forsyth and his men are ordered to pack up and head by ship back to India where the next front might be. Getting there, though, will not be a sure thing. From an historical point of view this series might be interesting, showing British soldiers going about their business in the various parts of the Empire, except that it was created and written by an apparent American. To give the man credit it definitely comes across as authentic, though whether that is by actually being so or just by extending existing stereotypes is not known. 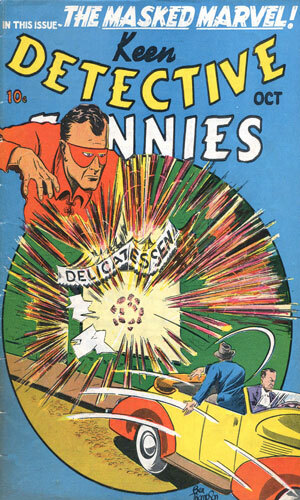 The confusing aspect to this series is the prominent title of "Spy Hunters" for so little of the adventure would really qualify as having anything to do with cloak and dagger work. This is standard military fare with the regiment engaging in standard defense against would-be invaders or insurgents. Neither of the main characters are connected anyway but loosely with an Intelligence group as might any other soldier or officer. And the fact that McLean completely disappears from the tales is just rude, not to mention very mysterious because the author made use of NCOs throughout the series so a brief mention of "Mac" would have kept the character active. Clearly the writer had a bias towards Forsyth and it was likely because Forsyth was an officer and thus in charge.